Drop everything—and read in your hot tub or sauna! April 10, 2018 – These days, when I peruse things online to inspire myself on what to share with you, I always come across things I’ve never seen before. Today, I was looking at all the various fringe holidays that are emerging. I came across D.E.A.R. Day, which is April 12th. This is a holiday I can definitely embrace. My aunt would love this one too! D.E.A.R. stands for “Drop Everything And Read” Day. The idea behind the holiday is to abandon all prior commitments and instead curl up with the comfort of a good book. Beverly Cleary, who wrote many books I enjoyed in my youth, is a spokesperson for the event. It’s primarily marketed towards children, which sounds like a terrific idea to encourage kids to read in this day of laptops, video games, iPads and smart phones that take them away from the joy of escaping into a good book. I will confess over the last few years that finding time to read has diminished for me. It seems like there are so many things to occupy my time. 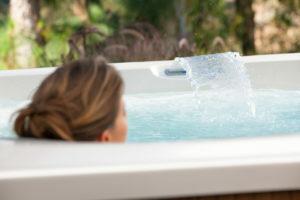 One of the saving graces has been the increased amount of travel I’ve done connected to owning a hot tub company. The time on planes has allowed me to get in some uninterrupted reading. Some of you may have read in my earlier blogs about me getting my own infrared sauna. One of the joys and treats of my sauna has been the opportunity to start each day getting some much-needed therapy—and also getting in some wonderful reading time. It’s become a habit where I give myself time to ready for the day ahead and enjoy a good book to boot. Reading can easily be done in your hot tub too! It may not seem feasible (water & paper?). But, avid readers should take heart! There is a neat product available called an AquaReader. The handy hot tub accessory is designed to float in the tub and features a clear acrylic holder that cradles your book open for reading. So…maybe it’s time to make celebrating D.E.A.R. Day part of your hot tub and sauna ritual! What a neat way to nurture your body and nurture your brain at the same time!